What can we do in Koto? The beautiful Japanese traditional cloth for tea ceremony. How about using them for the interior designing at home? 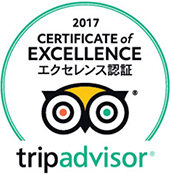 We have chances to see or touch the beautiful old clothes in the tea ceremony. 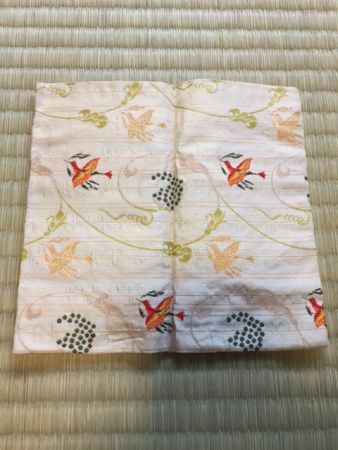 For example, kobukusa (the small square cloth), shifuku (a poach to be used for putting in a tea container), and the decollation for the hanging scroll. They are used to decollate or keep the tea utensils carefully in the tea ceremony, but we can use them for our home interior also. The traditional clothes for tea ceremony are parted into 3 groups, Donsu, Kinran and Kanto-, although it looks all same at a glance. 1, Donsu : It’s the most formal traditional clothes of the 3. It’s weaved with dyed yarns and the beautiful patterns are made by the cloth backing. It’s so soft silk that often used to make the bag for the tea containers. The photo is Rikyu donsu which has plum blossoms’ patterns. Rikyu is the name of the founder of Wabi-Cha, Japanese tea ceremony. 2, Kinran：The traditional cloth gold yarns are used. It’s thought as the middle formal clothes of the 3. This is the Kinran with pretty birds eating flowers and the arabesque. 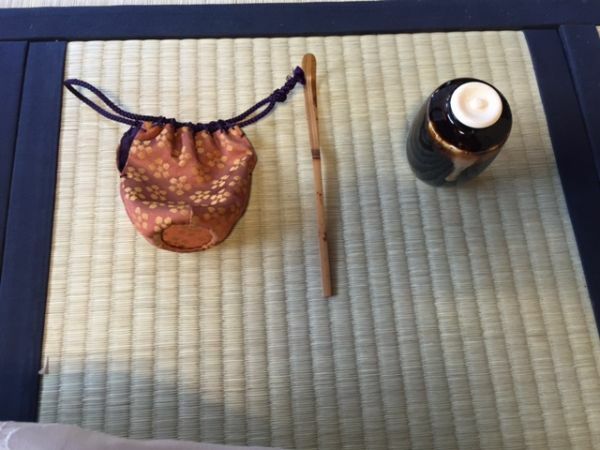 I often use this small cloth to bring tea bowls and sometimes to purify the utensils. 3, Kanto: it means striped patterns. The most casual ones of the 3. How about displaying them at your home? We sometimes use it to purify the tea utensils during the way of tea, sometimes it is put on the alcove to display some important things in the tea room. 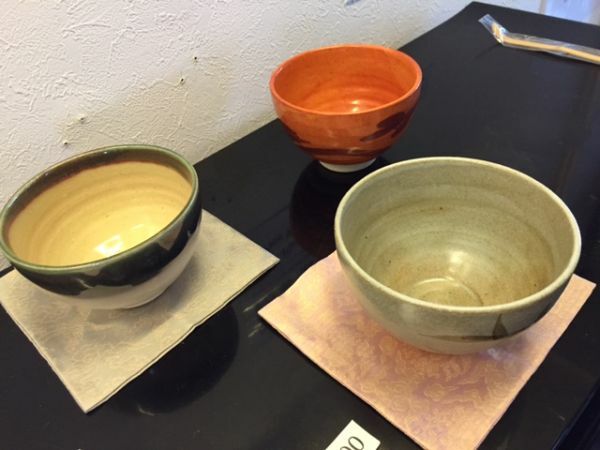 Not only the hosts, but also the guests bring them to join tea ceremony because we sometimes need them to watch and touch the important & expensive tea utensils the host shows. The occasion we can see them most often is when the staff bring tea bowls from the kitchen(mizuya) in the big tea ceremony with 20 or 30 guests. It looks politer. Not only tea ceremony, but also we can use them at home. How about using them for coasters? How about the mats for your important accessories or small ornaments? 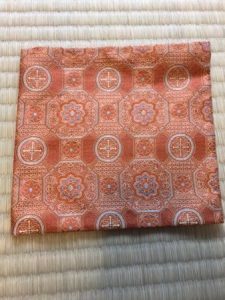 Many people who love tea ceremony buy fukusa, traditional clothes made by Tokusai Kitamura. 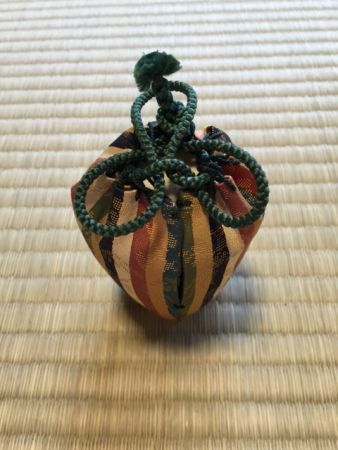 We can find rare colors’ larger fukusa here although red, orange and purple are the ordinary colors. The photo is the traditional pattern of kobukusa but they sell some modern European patterns as well. We can enjoy seeing the beautiful colors and interesting designs.